Ivanishvili holds forth on his behind-the-scenes decisionmaking. Georgian Dream party leader Bidzina Ivanishvili holds forth on state TV about his influence on Georgia's politics. Love him or hate him, Georgia’s richest man Bidzina Ivanishvili is the main show in town. When he gives one of his lengthy, oracular media appearances, everyone seems glued to their TV screens to get a read on where he is taking the country. In his latest interview, a 45-minute sitdown with Georgia's Channel One, the billionaire ex-prime minister essentially asked the voters to stick with him and the government of his choosing until at least 2030, when he expects Georgia to have finally reached the promised land. Georgia will be home free then, Ivanishvili said, with the country's gross domestic product per capita having almost tripled to $10,000 or – fingers crossed – even $12,000, and the Georgian dream of joining the European Union already a reality. Ivanishvili, who is widely seen as a behind-the-scenes puppetmaster of Georgian politics, was disarmingly honest in the interview about the influence that he has maintained over the government and the ruling Georgia Dream party since stepping down as prime minister in 2013. He expounded on how he has participated in key government decisions, such as selecting the new prime minister and searching for a candidate for new president, but denied that all that amounted to being the shadow ruler of Georgia. Ivanishvili played that role for five years before returning this year to formal politics, taking over the chairmanship of Georgian Dream. 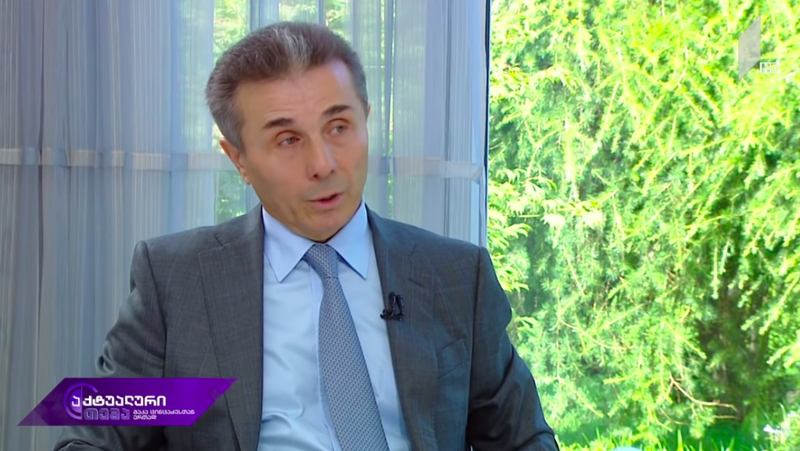 Ivanishvili admitted that he participated in selecting former Prime Minister Giorgi Kvirikashvili’s replacement, Mamuka Bakhtadze, and advised the new, young head of government on cabinet appointments. On the ongoing search for the Georgian Dream’s candidate for the presidential election this fall, Ivanishvili said that he prefers to have a non-partisan candidate or even let the opposition take the presidency, which has been reduced to a ceremonial role. “It will be good for democracy,” he said. His interviewer asked Ivanishvili another key question: what’s with his whim of uprooting and moving giant, century-old trees to his new park, a pastime that left patches of green land near the Black Sea coast defaced and deforested. “Where are you taking these trees?” Tsintsadze asked. “I know people are saying, ‘what is wrong with this guy?’” Ivanishvili conceded, but added that it is only for the good of the people. He compensated farmers and the Georgian railway authorities lavishly for the interruptions that the movement of giant trees may have caused. The barges and the heavy machinery he brought to Georgia to move the trees will stay in the country, and will potentially serve the public good, Ivanishvili said. He also defended another of his pet project, a pharaonic real estate complex that is controversially under construction in and around capital Tbilisi’s historic center, with its several segments to be connected with aerial trams. Ivanishili said that having a golf course a mere four-minute cable car ride from downtown will be a huge boon for the economy, and played down the project’s impact on the city's rich architectural heritage and its environment. Georgians reacted to the interview with everything from face-palms, to praise to condemnations. “We see a total evasion of responsibility for things that he [Ivanishvili] is responsible for,” said Elene Khoshtaria, a member of opposition party European Georgia, in comments to TV Priveli. “He installs people to lead the government, vouches for their qualifications and then replaces them if the public is disappointed, without taking any responsibility for it,” Khoshtaria said. Georgian Dream supporters were happy with their chairman’s interview, though some insisted that the party should have a candidate for the upcoming elections. “The society may not understand why the ruling party declines to participate in the presidential elections, said one party member, Tamar Chugoshvili.